Nowadays, companies such as the Amazon and Booking have developed personalized websites. 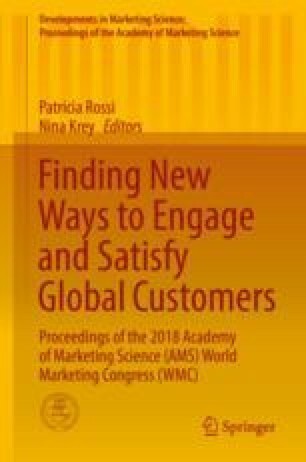 Advances in tracking and personalization systems enable them to learn more about their consumers and to adapt their website accordingly in order to improve their online services (Tam and Ho 2006). However, while prior research on web personalization investigates the technological development supporting the personalization system (Hauser et al. 2014; Liang et al. 2008), little is known about the web personalization experience and its value for consumers. With an interpretive approach, this paper tries to bring a deep understanding of the web personalization experience and the value creation process. In-depth semi-structured interviews were conducted with 20 consumers (9 women and 11 men, aged 21–64) to consider common and different perceptions (Vernette and Giannelloni 2015). We varied the sample composition by using purposive sample (Miles and Huberman 1994). We selected informants following some criteria: age, gender, web expertise, and web usage. Analysis and interpretations followed the grounded theory approach (Glaser and Strauss 1967). Regarding the experience on personalized website, it emerges from the results that most informants perceive web personalization and personalized advertising as a whole experience because of retargeting. With retargeting, informants are exposed to the same personalized message on the website and later on personalized ads displayed on other websites. In addition, most informants indicate they experience a loss of control during navigation as the website automatically personalizes content based on their surf behavior. The analysis highlights that characteristics of the web personalization experience can both create or destroy value. For instance, while the loss of control experienced during navigation generates negative emotional reactions such as an impression of categorization, it can also enhance guidance in website navigation when content is relevant. Besides, the analysis indicates that value creation aspects usually counterbalance value destruction ones. This paper extends the experiential marketing literature by specifically addressing the web personalization experience. While prior research focused on the technological development supporting the automatic adaptation of the website, this research examines web personalization in a marketing perspective by providing a deeper understanding and conceptualization of the web personalization experience and the value creation process.